Access to cost-effective service providers. Traill County maintains low-cost utility services to regional businesses and residential customers. With such a variety of public and private providers you can depend on affordable, dependable service to your business. 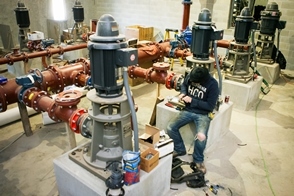 Water in Traill County is supplied by Grand Forks Traill Water District, Traill Rural Water, the City of Hillsboro and the City of Mayville. The Energy Information Administration 2017 report shows the average retail and commercial prices for electricity in North Dakota are some of the lowest in the nation. The City of Hillsboro provides the community of Hillsboro with city-owned electric service. Nodak Electric is a public utility cooperative based in Grand Forks serving as the electric distribution utility in a portion of northeast North Dakota, including rural Traill County. Nodak Electric provides power to more than 14,000 customers. Xcel Energy is an electricity and natural gas energy company offering energy-related products and services to 3.3 million electricity customers and 1.8 million natural gas customers. Xcel Energy serves the communities of Mayville, Portland, Hatton, Reynolds, Buxton and Cummings in Traill County. Dakota Carrier Network provides fiber running north from Traill County through Grand Forks, Bismarck, Fargo and back. This provides alternate routes and ensures fully redundant, uninterrupted service. Halstad Telephone Company provides an all-digital network of cable television, telephone, DSL and wireless broadband Internet service. Halstad Telephone Company also provides fiber routes. Midcontinent Communications provides digital cable, citywide build-out and two-way broadband services. Polar Communications provides wireless broadband and DSL service, plus telephone and cable television. CenturyLink provides DS3 alternate self-healing routes of fully redundant protection for local loop service and central office connectivity.